The May issue of Women’s Health has a feature on butternut using recipes from South African celebrity chefs. The four chefs that contributed their recipes are Reuben Riffel, Pete Goff-Wood, Luke Dale-Roberts and Margot Janse. I was offered the opportunity to blog a recipe of my choice, as well as offer my own recipe using butternut to tie in with this article. Last week you will have seen my recipe for roasted butternut soup, and when I paged through the four recipes I decided to make Reuben’s roasted butternut dish, as the flavours were similar to the dish I had made. The recipe I am including below is not the original recipe which appears in the magazine. I had to make a few changes for various reasons. This pesto is zingy and tangy and the flavours really pop in your mouth. I will definitely make this again with a few variations! do you make recipes from magazines? Add 60mls water and process until it forms a purée – this will be very watery! A peppadew is a sweet piquanté pepper. I love to use recipes from everywhere. The 1st time, I make it just like it is stated & then I make it like I want to! What a very unusual tasty pesto: a really good one too! It is always good to get yourself a birthday present! wonderful, good-for-you veggies that taste like MORE! they definitely tasted like more! Oh my that looks good Tandy! thank you Jacs, I am sure you would love it! Oh, those flavours sound amazing – I wonder if this recipe will adapt to our large tromboncinos? Hmm.. I have never tasted a tromboncino but please try and let me know! I need to be more involved with pinning! Fabulous sounding recipe, Tandy. I love roast butternut. Sounds lovely but whatever is a peppadew? This is such a lovely dish! 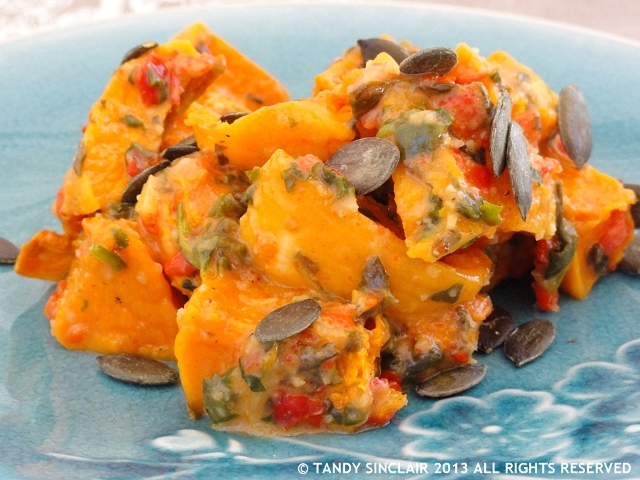 I love butternut paired with pesto! I don’t often make recipes from magazines, I do however often look at photos in magazines and create my version by just seeing the picture and reading a title. It was very fresh and delicious!